Can this connected sock replace a baby monitor? Parents are nothing but worry stuffed with more worry. And I can say that because I've made that transition from care-free human man to fretting father. So when I heard there was a way to monitor my baby's health at night, one that meant I didn't need to jump out of bed every time I couldn't hear her breathing, I jumped at that instead. I'm talking about the Owlet Smart Sock 2. Alright, in all honesty I'm not a massive worrier. But I worry a bit more than I used to, which was not at all. Even for a mild worrier this baby monitoring idea is appealing. During pregnancy the number of times you hear about the dreaded Cot Death it's tough not to have at least a small voice in the back of your mind making you second guess yourself. 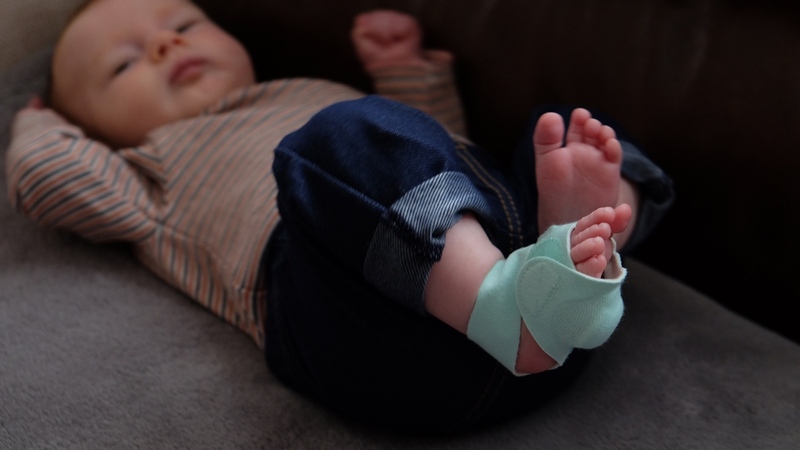 The idea behind the Owlet's second Smart Sock, which costs $299 and is designed for babies up to 18 months, is to offer a way to monitor baby's heart rate and oxygen levels, non-invasively. That means that your baby shouldn't know any different, but you will be alerted if you need to be – letting you actually rest a bit in the meantime. But did it work like that? Can you entrust your newborn's life to a sock with some tech in it? I used it on my baby girl from just under a month old to over two months to find out. Strapping anything to a baby is always going to be a challenge – they wriggle. Owlet appears to be one step ahead here. The Smart Sock 2 comes with a main unit for tracking that slips into three sizes of sock, meaning this product is good for 0-18 months. But it's the sock setup that I liked – despite the fact that Paul Lamkin, also a new-ish parent, is not convinced the concept of a sock is babygro friendly. Still, we got on well with it. You can use the Velcro straps to close the heel off, allowing you to pop this on and just close the front strap easily for a snug fit. The cotton material feels soft enough so even on that super smooth and sensitive baby skin you don't need to fret. That said, the instruction book would have you think otherwise with plenty of warnings about not doing the sock up too tight. I didn't worry too much about this and ended up finding a little redness on baby Ivy's foot when she woke in the morning the first time. But it's trial and error – after a few goes she had it on comfortably. So why worry about the fit? If it's wrong you don't get a reading and when that happens the alarms go off. One of the most precious commodities in the early days of being a parent is sleep. So when you nod off safe in the knowledge that Owlet is keeping a monitor of baby's vitals, that's great – the measurements never looked way off, it was all very stable and it was reassuring to see the "readings normal" screen. But when the baby moves – "Ivy is wiggling" – and the tracker loses an accurate reading and sets off an alarm, it's suddenly the worst gadget in the world. This is the main problem with the Smart Sock 2 – you need the alarm in case something really is wrong, but it's totally detrimental if it goes off at the wrong time. It did this a fair bit. To be honest, after a while we gave up using it as this is the one time in your life that you don't even need a wake-up alarm since the baby decides when we sleep. So if you turn the alarm off, is the Owlet worth having? The accompanying app was installed on my wife's iPhone as I'm Android and Owlet doesn't offer that option yet – it's in beta. On iOS, you get the clean minimalism you'd expect from a well made Apple app. This is great for ease of use and at-a-glance info, but not so great for depth of data. First up, you set up your baby with a pic and some basic info so the app knows age. This cleverly asks you to update the pic as your baby grows, making you realise the changes you might not notice as you're with the wee one everyday. A nice touch. The data the app deals out is simple though: heart rate and oxygen levels over 24 hours, one week and one month. So there's not much to it. But that's the point. You get everything fired up then relax in the knowledge that the app is doing its thing. When you get an alert for low oxygen levels or abnormal heart rate the phone notifies you – but primarily the base station lights up and plays an alert sound. (You can tap the base station to stop this.) The base station is also how the sock connects to your local Wi-Fi so you see the data live on your phone. This helps helps the sock sensor battery last that full 18 hours – which in real life meant a charge every few days. The app does let you keep an eye on your baby's vitals from all over the house, which is useful when running about. But realistically I didn't feel comfortable relying on that alone, opting for a smart camera monitor as the primary means of keeping an eye on the sleeping baby. The Owlet Smart Sock 2 works, there's no denying it. When this is strapped on it's a comfortably non-invasive way to measure your little bundle's vitals and Owlet's Connected Care platform is going to expand to sleep history as well as looking at RSV, pneumonia, bronchiolitis, chronic lung disorders and heart defects. So it should become more and more useful over time. Right now, the heart rate and oxygen levels appear to be accurate when the sock is in place. The problem is when it's not. You can't put the sock on too tight or it'll leave a mark. You can't put the sock on too loose or it'll lose its ability to track. So you're left a bit stuck. Best case it works, nothing is wrong and in the morning you find it's been marking your child. Worst case it comes a bit loose in the night as the baby moves and you're woken to an alarm. Unfortunately I found the latter to be the case. As such, we gave up on using this after a while as being woken when you don't need to be – and are already tired – just isn't worth it. Especially when it'll cost you $300 for the privilege.